In his documentary, Lucas Debargue: To Music, the director Martin Mirabel follows Lucas Debargue over the course of a year of first encounters and discoveries that made up his personal quest for his own musical voice. The pianist had just participated in the XV International Tchaikovsky Competition, where he took fourth place and went home with the prestigious Moscow Music Critics Association Prize, which distinguished him as a "pianist whose talent, artistic vision, and creative freedom impressed both the audience and the critics." The documentary unveils the first steps of a young artist discovering a life of touring, back-to-back concerts, studio recordings, after-concert parties, and autograph-signing sessions; an artist learning to work with conductors and chamber music partners. As we get to see, the first year was a whirlwind, but Lucas never lost sight of what is most important: the music. Performing, improvising, and composing occupy a key place in this new life. 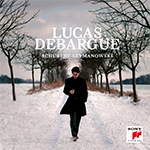 Lucas Debargue's new album Schubert & Szymanowski is available here. His previous albums: Scarlatti, Chopin, Liszt, Ravel is available here and Bach, Beethoven, Medtner is available here. Lucas Debargue appears courtesy of Sony Classical.